College of the Mainland musicians, Thomas Austin, left, and Austin Kelton have been selected to perform with the Texas Community College Band Directors All-State Jazz Ensemble and Symphonic Band next month. Two College of the Mainland students will perform with the Texas Community College Band Directors All-State Jazz Ensemble and Symphonic Band next month. 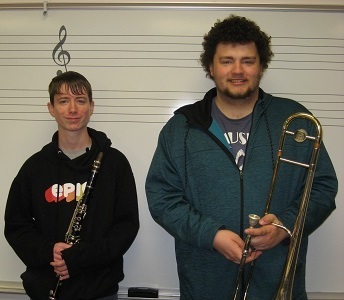 Austin Kelton and Thomas Armstrong, both music majors at the Texas City community college, auditioned and were chosen to play during the Texas Music Educators Conference on Feb. 16 in San Antonio. Armstrong, a clarinetist, is part of the Symphonic Band while Kelton, a trombonist, is part of the Jazz Ensemble for the second year. “I am really happy for them” said Sparky Koerner, chairman of the Fine Arts Department. Kelton will rehearse and perform under the direction of Rick Condit, director of the Lamar University Jazz Ensemble, and a former member of the Stan Kenton Orchestra. “That will be exciting for him, considering that Mr. Condit has an international reputation as a jazz educator and performer,” Koerner said. Kelton is part of the COM Jazz Ensemble and Concert Band and Armstrong is a member of the COM Concert Band. Both students are from Texas City and were part of the Texas City High School band program. Being a part of the All-State ensembles has become a tradition at COM with 32 students having performed in the All-State and All-Star jazz and symphonic bands in Texas and around the United States.